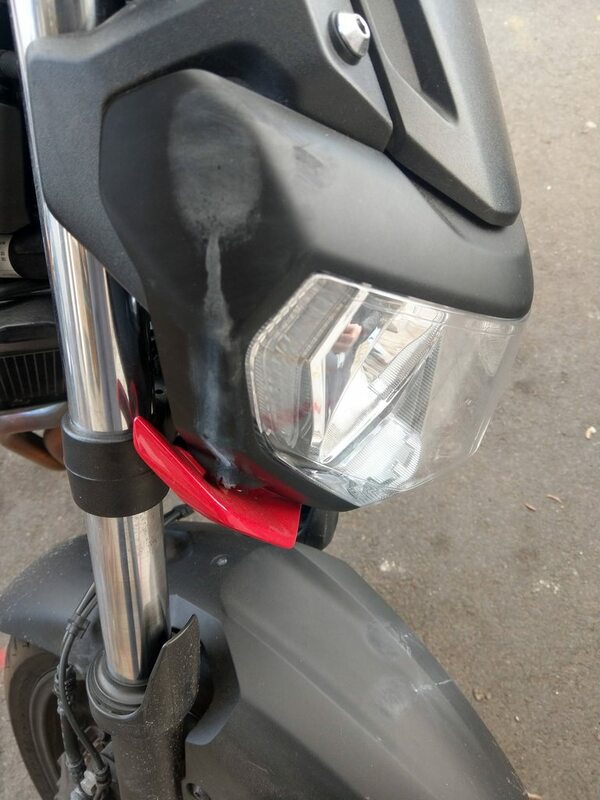 I have a big stain on my headlight plastic, not sure where it came from or what it is but soap and water won't remove it. Any idea what this is? Or how to remove it? The only way to get that plastic piece OEM is to order the entire headlight assembly. Can't drive around with this stain, any advice greatly appreciated. Looks like someone spilled brake clean or some kind of solvent there and it's oxidized the plastic. This looks like brake cleaner (or brake fluid) damage. I had the same think happen tot he carbon look on my front fender, turned milky white after getting hit with brake cleaner. I took a cotton cloth (T Shirt) and dampened t with Acetone. I lightly swiped the area in one direction with lite pressure a few times, allowing it to dry a minute or so between swipes. It got rid of the milky look, but the area is a little different looking than the rest (see front of fender in picture), but it went from ruined to usable for me. You could also repaint it with something like SEM Trim Black. I wonder if T-Cut is worth trying on a small part of it? As others mentioned, paint. It's also the cheapest fix.